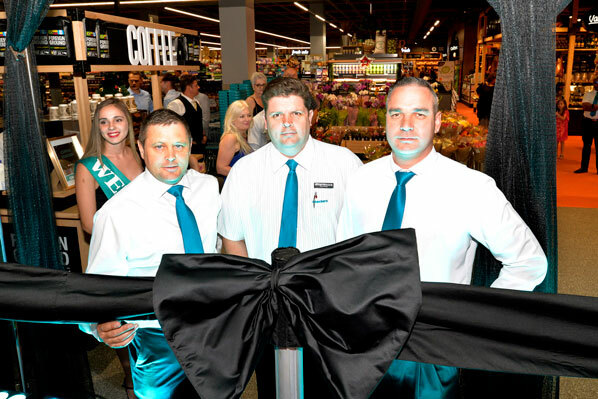 The new, state-of-the-art Checkers Mimosa Mall promises greater convenience and an elevated customer experience including wider aisles as well as the introduction of new in-store services, such as a coffee bar and sushi bar. Other in-store fresh food departments include a Meat Market, Hot & Cold Foods Deli, Bakery and Fresh Fruit & Vegetables. Stefan Gouws (Divisional Manager), Wouter Heckroodt (Branch Manager) and CJ Prinsloo (Deputy Divisional Manager). The store’s trading hours are 07:30 - 20:00 from Mondays to Fridays, 07:30 - 18:00 on Saturdays, and 08:00 - 17:00 on Sundays.